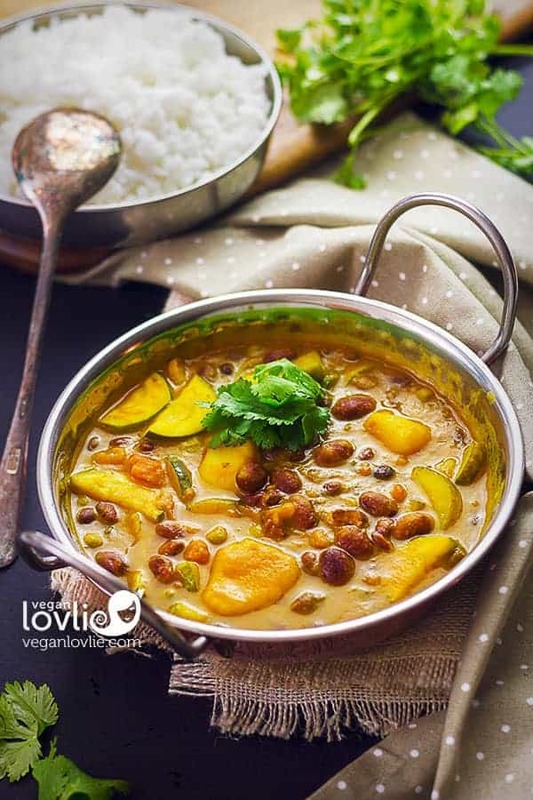 A vegan version of the Mauritian Cassava Stew / Yuca Stew (Kat Kat Manioc as it is known in Mauritius) which is prepared with greens, beans and cassava. Literally digging out our roots, we find a variety of edible tubers that sustained and nourished many previous generations but are now alas gradually disappearing from our plates. One such root vegetable is the cassava (or yucca) which, besides its nutritional value, a taste of its creamy flesh is like the taste buds discovering or, more likely, rediscovering a whole wealth of long lost flavours and textures. As the mercury bitterly drops below zero over here, what could be more comforting than a pot of aromatic, hearty sauce enveloping creamy morsels of cassava, toothsome baby lima beans, meaty portobello mushrooms and fresh spinach greens? A bowl of piping hot cassava stew is more than welcome to warm us up to the core, from the tummy to the tip of the toes and fingers. 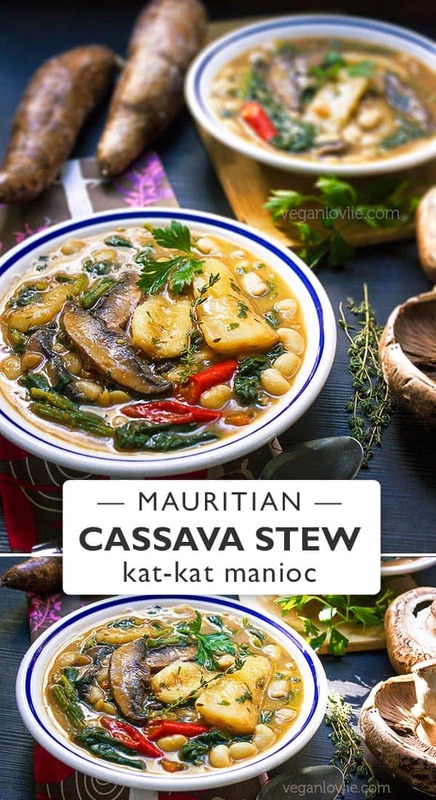 Originally the Kat-Kat Manioc, as it is locally known in Mauritius, or the Cassava Stew is a meat dish with greens along with the cassava. But my version is a vegan one where I am using baby lima beans and portobello mushrooms. Traditionally, garden nightshade greens, or what is locally known as brèdes martin or morelle, are used in this stew. But due to unavailability here, I am using Chinese spinach which delivers an equally delicious appeal. You may also use swiss chard, beet greens, rainbow or green chard. While the Kat-Kat Manioc is often made in a pressure cooker with everything cooked together, I am using a pot instead and pre-cooking the cassava before adding it into the sauce. With tomatoes being introduced into the recipe, as my personal addition for more flavour, the acidity within them tend to react with the starch rendering the cassava quite tough thus taking longer to cook. With a stronger flavour than white or cremini (chestnut) mushrooms, portobello mushrooms works to perfection in this hearty stew for their thick and meaty bite. But if you can’t find portobellos where you live, you can substitute with any other types of mushrooms. Watch the video which takes you through how to prepare cassava and the making of the Cassava Stew recipe. Cut the cassava roots into 2 to 3 pieces across. Make a slit in the skin all the way to the pink layer that is underneath the outer layer. Slide the knife under the pink layer and pull as you continue to slide the knife. The skin should come off fairly easily. Make sure both the outer layer and pink layer are completely removed. Once peeled, cut the cassava pieces in half lengthwise and place them into a pan filled with water so that the water reaches the cassava up to ¾ of the way. Cover and turn the heat on to medium and allow the cassava to boil. The cassava usually takes about 15 to 20 minutes to cook. Test if they are soft with a fork then remove them from the pan. Keep the water that they have been boiling in as we will use this later. Remove the fibrous stem in the middle of the cassava and leave the cassava aside for now. While the cassava is cooking, you can prepare the other ingredients like dicing the tomatoes, chopping the parsley, chillies and spinach. To make the stew, use in a deep pot. 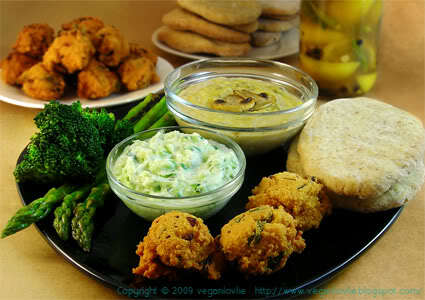 On medium temperature, heat one tablespoon of coconut or vegetable oil. Add one tablespoon of minced ginger. If using a mixture of garlic and ginger paste, add this instead. And add in one small diced onion at this stage if using. Let these sizzle for about 30 seconds. Then add the cumin and let this roast for another 20 seconds. Add in the chopped tomatoes followed by a little bit of the water in which the cassava has been boiling. Now add in one vegetable bouillon cube or one tablespoon of bouillon powder. Mash the cube so that it dissolves more easily. Then add the rest of the cassava water which is about one cup. Add in the mushrooms followed by the chillies. Next add the pre-cooked or canned baby lima beans. Add in about one cup of water or vegetable broth, if you did not use a bouillon cube, and a few sprigs of thyme. Now add in the pre-cooked cassava and parsley. Give everything a good stir. Cover and let the stew simmer for about 10 minutes or until the sauce is a little thicker. Finally add in the greens. These won’t take long to cook. So, cover the pan and let them wilt for a few minutes. Stir, adjust the amount of water if required and add salt to taste. Turn off the heat. The Kat-Kat Manioc is now ready. 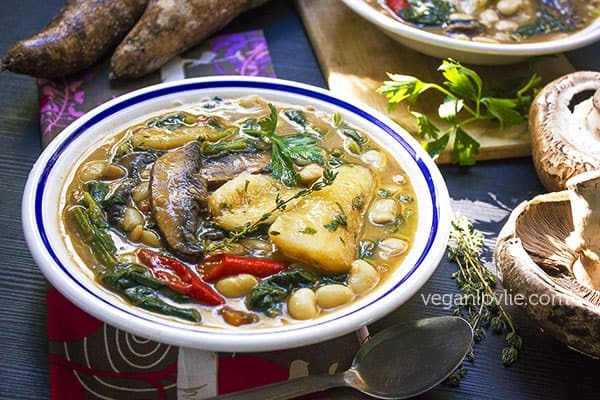 This is a very delicious, nutritious and wholesome meal that is often eaten on its own as a soup or you may accompany it with some bread or rice. 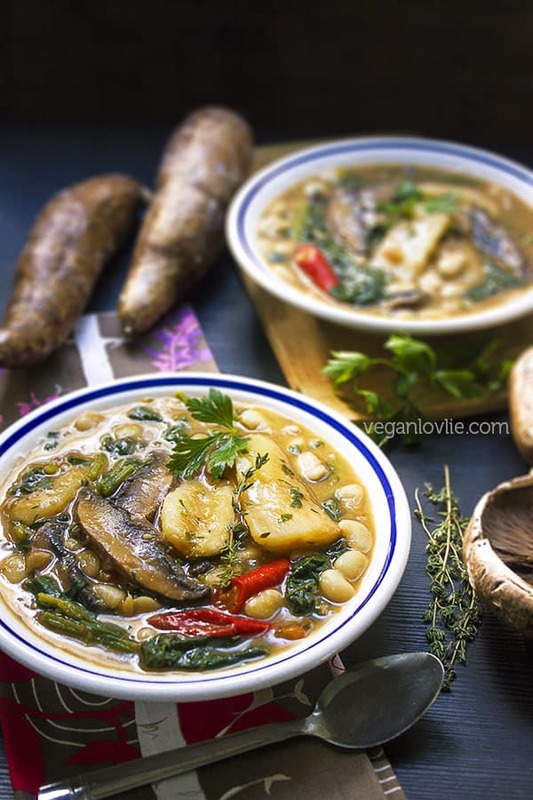 A hearty delicious nutritious vegan version of the Mauritian cassava (yuca) stew — Kat-Kat Manioc — that is prepared with mushrooms, beans, spinach along with the cassava. 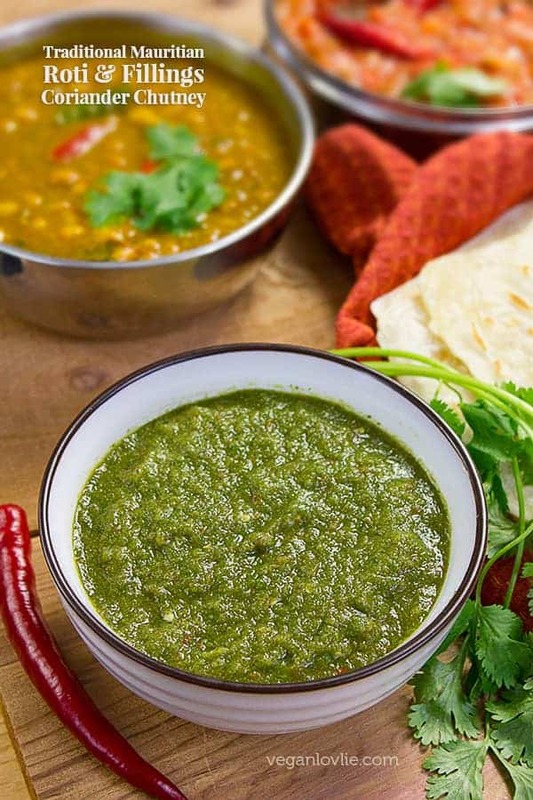 This dish is often eaten on its own as a soup or accompanied with bread or rice. To make the stew, use in a deep pot. On medium temperature, heat one tablespoon of coconut or vegetable oil. Add one tablespoon of minced ginger. If using a mixture of garlic and ginger paste, add this instead. And add in one small diced onion at this stage if using. Let these sizzle for about 30 seconds. Then add the cumin and let this roast for another 20 seconds. Add in the chopped tomatoes followed by a little bit of the water in which the cassava has been boiling. Now add in one vegetable bouillon cube or one tablespoon of bouillon powder. Mash the cube so that it dissolves more easily. Then add the rest of the cassava water which is about one cup. Now add in the pre-cooked cassava and parsley. Give everything a good stir. Cover and let the stew simmer for about 10 minutes or until the sauce is a little thicker. Finally add in the greens. These won’t take long to cook. So, cover the pan and let them wilt for a few minutes. The Kat-Kat Manioc is now ready. Serve as a soup on its own or stew with bread or over rice. If you liked this recipe, you might also like this Cassava and Sago in Coconut Milk recipe. I made this one for dinner last night. Lovely hearty stew for a winter meal. So good! 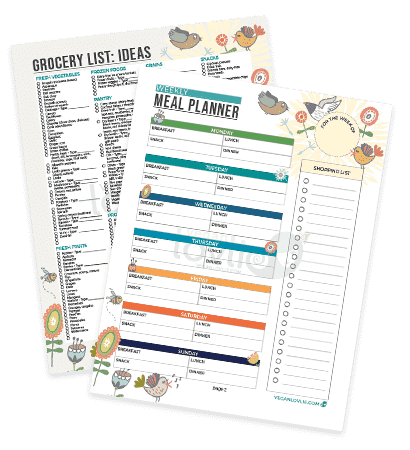 A really great recipe! First time of cooking cassava for me but it was really easy! Many thanks!